What’s the most accurate predictor of a new Chief Financial Officer candidate’s job potential? Many people think it’s an interview, one where they “get a read” on the recruit’s likelihood to fit into their organization. Nothing could be further from the truth. The typical job interview – while the most widely used selection tool – is also one of the least successful in predicting outcomes. In most studies, interviews rank 5th in predicting performance, particularly with manager candidates like Chief Financial Officer. Used correctly, however, as part of a disciplined selection approach, an interview can be very telling. The first issue is FOCUS . . . make sure your interviews are guided by the success profile you’ve chosen for your manager position. Next, use a classic “coning approach” with questions to obtain the information needed to assess the candidate against specific profile elements. After the interview, individual assessment scores can be summarized, and a determination made as to how to move forward with your Chief Financial Officer candidate. Click on the adjacent Interview Guide front page. This illustrates how the Chief Financial Officer interview focuses on the 13 critical factors of the job. 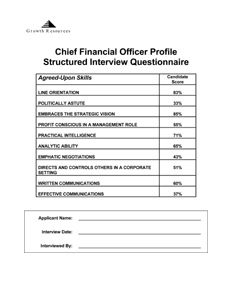 Click here to request a complete sample Chief Financial Officer Interview Guide. Chief Financial Officer Interview Guide.